This week saw the release of Quentin Tarantino’s Top Ten Films Of 2013 (So Far), otherwise known as the only list where The Lone Ranger is likely to appear, besides Jerry Bruckheimer’s List of History’s Most Grievous Errors That Shall Soon Be Rectified. Yet while some may have wondered what Tarantino could have loved so much about the film, besides a shared affinity for fast-and-loose history and overlong running times, he recently expounded on it to French weekly Les Inrockuptibles (as reported by The Playlist): He really liked the train. “The first forty-five minutes are excellent,” Tarantino said. “The next forty-five minutes are a little soporific. It was a bad idea to split the bad guys in two groups; it takes hours to explain and nobody cares. Then comes the train scene—incredible! When I saw it, I kept thinking, 'What, that’s the film that everybody says is crap? Seriously? 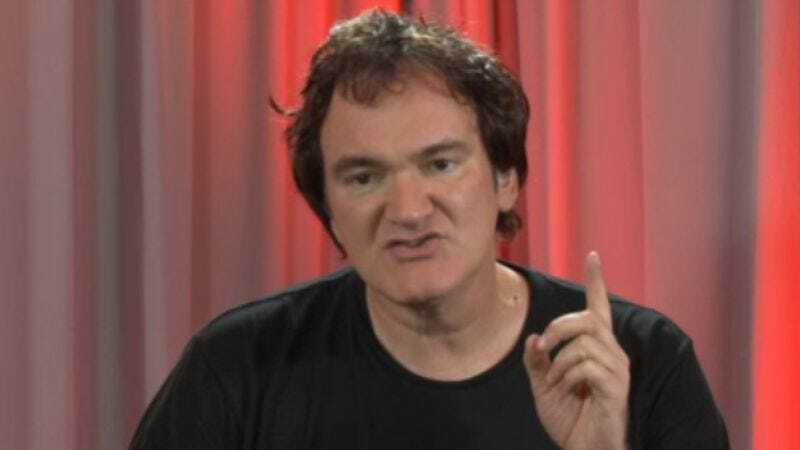 '” Tarantino then elaborated that he still had some problems with it that a cool train couldn't fix, namely the rather cavalier treatment of a very real tragedy like the Native American genocide—something the French interviewer oh-so-cleverly tried to compare to Tarantino’s depictions of slavery in Django Unchained, only to have Tarantino laugh it off with, “Frankly, I think I did it better than them.” But still, the trains! We also learned—in a conversation that was ostensibly about a director’s opinions on the film happenings of the past year, but which could have easily doubled as a conversation with an adorable 5-year-old—while Quentin Tarantino liked the trains, he doesn’t like Batman. Explaining why he had no opinion on Ben Affleck’s casting in the Man Of Steel sequel, Tarantino echoed Matt Damon in saying, “Batman is not a very interesting character. For any actor. There is simply not much to play. I think Michael Keaton did it the best, and I wish good luck to Ben Affleck. But, you know who would have made a great Batman? Alec Baldwin in the '80s.” (Though The Shadow begs to differ.) Anyway, anyone invited to one of Tarantino’s birthday parties now knows: Bring him a train, not a Batman.